Dare To Play It Big, Issue #072 -- Are You Using The Power Of The Mirror? Are You Using The Power Of The Mirror? The monthly thought: Are You Using The Power Of The Mirror? So: that's for 2013. At the end of a year I like looking back and taking note of the lessons I've learned over the year. These are the stepping stones to new stages and new knowledge. What I get out of doing this is the knowledge that I don't need to repeat a lesson that I've learned. I can choose a new action, which leads to a new path. I find this applicable to anything, from using a can-opener, to choosing your attitude at work. I've always been fascinated by mirrors. I remember being very scared of mirrors placed at the end of corridors or at the top of staircases, for instance. And I remember looking deeply into my eyes in mirrors, looking for answers, at my most desperate times. Nowadays I use mirrors for a very different purpose: to check what I wear, and to reconnect with Source. Or Love, whatever you want to call it. A few years ago I read in Louise Hay's 'You can heal your life' how she recommends looking into one's eyes in a mirror and saying 'I love you'. Have you ever done that? 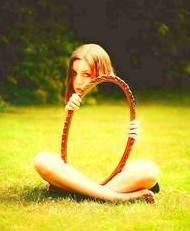 There is also the idea that each person is a mirror of ourselves. I've encountered this in a literal sense with a few people - people who are so at home with themselves that they offer you a clean, clear surface. When you are talking with them, you find yourself welcome, at home - with no need to put up defenses. And then, suddenly, you find yourself as if talking to a mirror. You see yourself so clearly, because the other person gives you the space to make that possible. The experience is actually far richer than I can describe. Now, you can also get closer to Home by using a mirror. I'm not saying just glancing over the image for a few seconds; I mean setting some time aside to sit and look into your own eyes in a mirror - without taking your eyes away. You will *know* when you don't need to keep looking. In my working with mirrors, I found that first there they tend to be layers - I didn't want to keep looking into my eyes. There was sadness, fear, sorrow - it didn't feel good. I remember in occasions crying a lot as I looked through the pain. But as I kept looking, a compassion started to arise. There was a genuine compassion for all the suffering I had experienced; and then, there was Love. It was a source of love belonging to the entire Universe, pulsating and vibrating through everything. That's the Love that I now like coming back to when I pick up a mirror. That's available to all of us, I believe, if we work through the layers we encounter. The 5 Gateways is a documentary that explains the awakening process through 5 'gateways'. I actually mentioned it briefly in this newsletter back in April 2011 - I have now watched it again and again found it very valuable. You may identify that you've moved through some or all of the gateways already, or you may find that a particular part of the documentary calls you specially. It feels to me that it's one of those works that contain timely messages - check it out! The 5 Gateways . Thankful for... comfy winter socks! I'm quite lucky that the room that I've converted into my studio has good heating and allows me to be barefoot on the carpet most of the time. But other times, when my feet start getting chilly, I love the feeling of warmth and softness and thickness of winter socks - it feels extremely soothing! "Every decision I make is the choice between a miracle and a grievance. I choose the miracle and release the grievance."